The Golden Gate Bridge is a suspension bridge that crosses over the San Francisco Bay, going from San Francisco to Marin County, in the U.S. state of California. It was opened for use in 1937. When the bridge was finished, its length of 9,266 ft (2824 m) made it the longest bridge in the world. Now there are several bridges that are longer, but for many people, it is still one of the most beautiful bridges in the world. Before the bridge, the only way to go north from San Francisco to Marin County was by ferryboat. The trip by ferry took 20 minutes to complete. Before the bridge was built, San Francisco was the biggest American city still served mostly by ferries. Some experts did not think that people could build a bridge because the water currents between Marin and San Francisco were very strong. Also, the water was very deep in the middle - 102 m - and there was a lot of wind and fog that could make building a bridge difficult. In 1916, San Francisco's city engineer asked other engineers to offer ideas for a bridge. One man, Joseph Strauss, designed a very cheap bridge - only $17 million, but many thought it was ugly. Local authorities asked him to change the design and to work with other experts. He agreed. He and other experts, especially architect Irving Morrow, designed the bridge again, this time as a suspension bridge. A suspension bridge has tall towers that hold long cables, and the cables hold up or "suspend" the bridge. The bridge is called the Golden Gate Bridge because it crosses the Golden Gate Strait, the area of water between the San Francisco peninsula and the Marin County peninsula. In 1930, people in San Francisco and Marin County agreed that the local governments could sell bonds to the public to raise money for the bridge. The new bridge was going to cost $30.1 million. But it was difficult for the governments to sell the bonds at the time because of the Wall Street Crash of 1929. Finally, the Bank of America, which was based in San Francisco, agreed to buy all the bonds to help the local economy. Construction began on January 5, 1933 and was finished in April 1937. Eleven men died during the construction, so the builders put a net under the bridge for the safety of the builders. Nineteen men were saved by the net. When they finished the bridge, they painted it with a reddish-orange sealant, a type of paint that protects the bridge from water and humidity. People liked the color because it looked good with the bridge's surroundings and it was easy to see in the fog, so the bridge was officially painted with the color, called International Orange. People can cross the bridge in cars or motorcycles any time. During daylight hours, they can cross by bicycle or on foot. They can not cross the bridge on roller skates, skateboards, or mopeds. When the bridge opened, drivers had to pay 50 cents to cross the bridge in either direction. 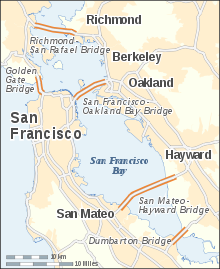 Today, when drivers go north on the bridge (leaving San Francisco) they do not have to pay, but starting on September 2, 2008, when going south (entering San Francisco), they have to pay $6 if they pay cash or $5 if they buy a Fastrak pass. People often jump off the bridge to commit suicide (kill themselves). They fall 75 meters and most of them die when they hit the water. Over 1600 people committed suicide by jumping off the bridge. ↑ "Golden Gate Transportation District". Goldengate.org. Retrieved 2010-06-20. 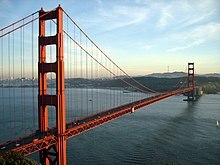 Wikimedia Commons has media related to Golden Gate Bridge. This page was last changed on 13 February 2019, at 13:29.